Now that is some serious snow…and it only gets worse in our small backyard. I mean, how high can I actually raise the snow shovel above my head to get it to stay on top of the already humongous pile anyway? OK, back to why I’m bringing all this up. 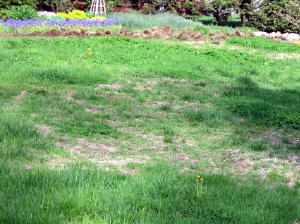 After that much snow comes spring (eventually) and the dreaded snow mold that we always get on the small lawn area in our front yard. Wait – I forgot to say that our lawn was already stressed from drought last summer accompanied by a town watering ban from June through September. Not to mention the grubs, who found those conditions perfect for digging in and eating the grass roots, killing every blade. 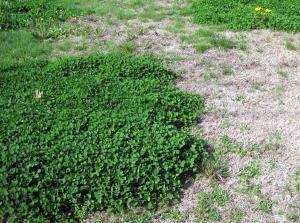 By fall, the only green to be seen was clover and the crab grass and violets that moved in from neighbors on all sides. What a mess. 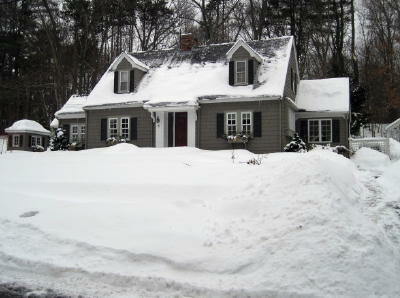 The long New England winters offer a lot of time for dreaming and planning changes for yards and gardens. As you can see, things didn’t look any better in the spring. These photos were taken in early May. OK, enough preaching. I’ve talked the talk to many of my clients…now I’m walking the walk. He was in. He cleaned the shed and gave away the mower. Now we were both committed to this project.